Clayton Hotel Cardiff is conveniently located in the centre of Cardiff City, only a short walk from the Cardiff Central train station and bus station. The city stop for Cardiff airport shuttle bus is directly opposite the hotel. The great location is one of the hotel’s best attributes and whether you are travelling by car, train, bus or air, it’s the perfect choice for a stay whether you’re in Cardiff for business or leisure! 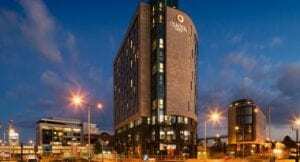 Largest hotel in Cardiff city centre with well-appointed, air-conditioned rooms. There is no onsite parking at Clayton Hotel Cardiff however, there are plenty of options nearby. Just over a 1-minute walk to/ from the hotel. Payment: Pay & Display at ticket machines using cash or follow machine instructions to pay via card. Details: Open air car park. 5-6-minute walk to/from the hotel. Payment: Payment to be made at hotel reception when leaving the car park to available of the discount. Details: Secure multi-storey parking, height restriction 1.85m, disabled spaces available. Clayton Hotel Cardiff is the closest hotel to Cardiff Central Train Station, only 0.2miles away and just over a 1-minute walk. First opened in 1850, Cardiff Central train station has provided convenient train travel to thousands of passengers travelling to and from the Welsh capital for many years. Direct trains to London run every 30 minutes, including high-speed services which take only 2 hours from station to station. ● Exit Cardiff Central train station by the main entrance. ● Turn right and walk to the city centre. ● Follow the footpath to the right and you will reach the entrance of Clayton Hotel Cardiff. Cardiff International Airport is 15 miles from Clayton Hotel Cardiff. See the transport options below. Where: Collects you outside the airport and drops you outside Clayton Hotel Cardiff. Frequency: This airport shuttle bus service runs every 20 minutes 05:00am – 0:00am. Journey time is approximately 35 – 40 minutes. A taxi from Cardiff International Airport to the hotel will cost between £20-30 depending on traffic. Journey time is approximately 20 – 30 mintues. To book a taxi to/from the airport you can contact the hotel reception on 02920 668866. Bristol Airport is 50 miles from Clayton Hotel Cardiff. We recommend either catching National Express Coach direct from Cardiff to Bristol Airport or one of the frequent trains to Bristol Temple Meads and connecting to the airport shuttle services.